Click here to see what AdvisoryHQ says about saving money through Online Pharmacy. Click here to see what The Washington Post says about reducing health care expenses. CINCINNATI­­ – (BUSINESS WIRE) -- ­HealthWarehouse.com, Inc. (OTCQB: HEWA) announced today that its net sales for 2016 increased 48% to $10.4 million compared to $7.0 million in 2015. HealthWarehouse.com is a Verified Internet Pharmacy Practice Sites (VIPPS) and Vet-VIPPS accredited online and mail-order pharmacy licensed and/or authorized in all 50 states. The Company attributed its 2016 sales performance to growth in core consumer prescription and over-the-counter product sales. For the year ended December 31, 2016, net sales increased 48% versus 2015. Total orders increased 78% from 150,322 orders in 2015 to 268,334 orders in 2016. (CINCINNATI, OH, August 29, 2016) -– HealthWarehouse.com, Inc. (OTCQB:HEWA) announced today that it expects August 2016 to finish as the best month for consumer sales in the Company’s history. Consumer sales, which include prescription and OTC products, are expected to top $900,000 for the first time ever, representing $10.8 million on an annualized basis. Based on the August 2016 forecast and actual sales through July 31, 2016, we expect the Company’s revenue for the year ended December 31, 2016 will grow by nearly $3 million or 43% to over $10 million as compared to the year ended December 31, 2015. The Company reported $1.7 million in revenue in Q3 of 2015 and sales of $7.0 million for the year ended December 31, 2015. Since its formal advertising and promotional campaign began in September 2015, sales have accelerated through local, regional and national publicity culminating in record growth of 51.2% in the Company’s consumer business for the 2nd Quarter of 2016, as compared to the 2nd Quarter of 2015. In addition, the Company received the BizRate Circle of Excellence Award in 2015, putting it in the top 2.9% of more than 4,700 retailers for outstanding customer service and satisfaction. “We continue to see unprecedented growth in the Company’s consumer business. We are executing on our strategy to grow revenues with high margins while maintaining cash flow breakeven,” said Daniel Seliga, Chief Financial Officer and Chief Operating Officer. Soaring drug prices are a growing concern for many, with an estimated 32 million people affected by at least one price hike in the last year. The price jumps have hit both generic and brand-name prescriptions. Isuprel, a drug used to treat heart rate problems, went from $180 to $1,472 per dose because a generic wasn't available. Marlene Condon relies on hydroxychloroquine to help keep her rheumatoid arthritis under control. The generic has been available for almost 20 years, but recently the price skyrocketed. To transact such other business as may properly come before the Annual Meeting. Will Hillary or Trump Save You Money on Prescription Drugs? FLORENCE, Ky., Aug. 1, 2016 /PRNewswire/ -- Can the Presidential candidates save you money on prescription drugs? 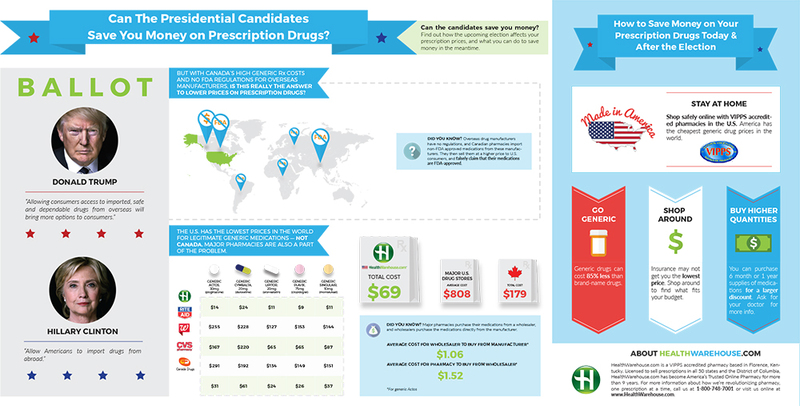 HealthWarehouse.com, Inc. (OTC: HEWA), the only VIPPS-accredited online pharmacy licensed in all 50 states, took a look at what the candidates are saying and offers advice on how to save money on drug prices today and after the election. Keep reading to see HealthWarehouse.com's tips for saving money on your prescription drugs. FLORENCE, Ky.--(BUSINESS WIRE)--HealthWarehouse.com, Inc. (OTC:HEWA), the only VIPPS-accredited online pharmacy licensed in all 50 states, announced today that it has become the 23rd Veterinary Verified Internet Pharmacy Practice Sites’ (Vet-VIPPS) pharmacy through the National Association of Boards of Pharmacy (NABP) making it the only online pharmacy with both VIPPS and Vet-VIPPS accreditation. “HealthWarehouse.com has seen significant demand from its customers and consumers looking to fill their pet prescriptions at affordable prices with convenient home delivery. HealthWarehouse.com is now the only online pharmacy that can service both humans and pets together creating unparalleled convenience for consumers looking to shop for their entire family,” said Lalit Dhadphale, President & CEO of HealthWarehouse.com. Analysts expect pet industry expenditures to reach $62.75 billion in 2016 and nearly $92 billion by 2019. As 1 of 23 Vet-VIPPS accredited pharmacies, uniquely positions HealthWarehouse.com to fully participate in this large and growing market. Are prescription drugs cheaper to buy without health insurance? SAN FRANCISCO (KGO) -- A recent Consumer Reports survey found it can be cheaper sometimes to pay for prescription drugs out of pocket than with insurance. 7 On Your Side's Michael Finney talked to a San Francisco nurse who knows that first hand. Follow the link below for the full story. The problem of rising prescription drug prices is rampant. Some 32-million people were hit with price hikes in the past year, according to a Consumer Reports survey. And it's not just for big brand names or specialty drugs. Even prices for longtime generics drugs are increasing. Consumer Reports has just released results from its investigation of high drug prices. It found that when people face higher drug costs, they don't go to the doctor and they don't always fill their prescriptions. And when they do fill their prescriptions, they don't take the medication as directed. In most cases, pharmaceutical companies can raise the price of drugs without any restrictions. So what can you do? CONSUMER REPORTS -- The problem of rising prescription drug prices is rampant. Some 32-million people were hit with price hikes in the past year, according to a Consumer Reports survey. And it's not just for big brand names or specialty drugs. Even prices for longtime generics drugs are increasing. Click here to see what Consumer Reports says about rising drug costs. FLORENCE, KY.--(BUSINESS WIRE)--HealthWarehouse.com, Inc. (OTCQB:HEWA), announced today that it has met standards required by the Better Business Bureau for accreditation with the organization. Consumers who shop for prescription medications must feel comfortable about their pharmacy especially when shopping online. While VIPPS accreditation helps consumers to distinguish between legitimate and illegitimate pharmacies, for decades the BBB seal has signified to consumers merchants that value honesty and integrity. BBB Accreditation means HealthWarehouse.com adheres to very high ethical standards. People know they can trust a company that has made the commitment to live up to the BBB Code of Business Practices. The rise of digital healthcare is creating opportunities for online retailers and consumer brand manufacturers with e-commerce expertise. When Walgreen Co. vice president of digital health Adam Pellegrini envisions how the U.S. healthcare system will look a few years from now, he adjusts his focus. He looks past today’s massive $4 trillion system that’s mired in paper and operates largely on outdated computer systems and isolated databases. Instead Pellegrini sees a time when the Internet will enable millions of U.S. consumers to access e-commerce sites to purchase health services, manage their appointments and data, and research health issues. StockNewsNow.com Publishes New SNNLive Video Interview with HealthWarehouse.com, Inc.
HealthWarehouse.com, Inc. (OTCQB: HEWA) is a VIPPS accredited online pharmacy based in Florence, Kentucky, and the Company is focused on the growing out of pocket prescription market, according to the company’s website (see here: www.HealthWarehouse.com). SNNLive spoke with Lalit Dhadphale, President and CEO of HealthWarehouse.com, Inc. at the Growth Capital Expo 2016 in Las Vegas, NV. (CINCINNATI, OH) -- HealthWarehouse.com, Inc. (OTCQB:HEWA), the only VIPPS accredited online and mail-order pharmacy licensed in all 50 states, announced financial results for the quarter ended March 31, 2016 on Thursday, May 13, 2016. For the quarter ended March 31, 2016, net sales improved to $2,347,798 up 45.6% from the prior year ended March 31, 2015. Gross margin increased to 62% while net loss narrowed to 10.8% of sales in the quarter ended March 31, 2016 from 12.4% for the quarter ended March 31, 2015. For the quarter ended March 31, 2016, HEWA reported adjusted EBITDAS of ($107,091), vs. adjusted EBITDAS of ($65,406) for the quarter ended March 31, 2015 primarily due to increased staffing and advertising costs. The Company believes that adjusted EBITDAS (Earnings Before Interest, Taxes, Depreciation, Amortization and Stock-Based Compensation), a non-GAAP financial measure, is useful in evaluating its operating performance compared to that of other companies in our industry. If you take prescription medications regularly, chances are you’re suffering an acute side effect these days: sticker shock. Retail prescription prices have increased six times faster than the general inflation rate, according to an AARP Public Policy Institute report released in February — and no relief is in sight. The Segal Group, a benefits consulting group, estimates prices will rise another 9.8 percent in 2016. As a consumer, you have just one weapon: comparison shopping. Prices for individual drugs can vary widely, even within the same ZIP code or retail chain. Yet only about 17 percent of consumers try shopping at different pharmacies, according to a 2015 Consumer Reports study. (LAS VEGAS, NV, May 3, 2016) -- HealthWarehouse.com, Inc. (OTCQB:HEWA), the only VIPPS accredited online pharmacy licensed in all 50 states, will present at the 3 rd annual Growth Capital Expo MicroCap Investor Conference, held on May 3 rd – 5 th , 2016 at Caesars Palace in Las Vegas, NV. The company will be presenting on Wednesday, May 4th at 1:30pm PST and an audiofile will be available following the presentation at: http://wsw.com/webcast/gce3/hewa. GREENSBORO, NC -- We buy just about everything online these days but what about prescriptions if they're not from a big box store you know? Consumer Reports does recommend one website - healthwarehouse.com. It's a US-based website and licensed to do business in all 50 states. Any time you shop for medicine on-line you need to look for a specific icon on the website. It's the VIPPS symbol which stands for Verified Internet Pharmacy Practice Sites. "It is an indicator that it has been checked and dated by the National Boards of Pharmacy," says Lisa Gill with Consumer Reports Best Buy Drugs. A Cincinnati investment group has acquired nearly 500,000 shares of preferred stock in HealthWarehouse.com Inc., a Northern Kentucky-based online pharmacy that has seen a surge in business recently. MVI Partners, an Ohio limited liability company that includes residents of Greater Cincinnati and Northern Kentucky, entered into an agreement to buy 95.7 percent of the outstanding Series B preferred stock in HealthWarehouse (OTCMKTS: HEWA), according to a filing made today with the U.S. Securities & Exchange Commission. The stock was trading at 37 cents at mid-afternoon today, the same as the previous close. The value has ranged from 9 cents to 50 cents over the last 52 weeks. At first glance, Sacramento’s SCI-FIT looks like any other gym. Until you realize the people working out are in wheelchairs. SCI-FIT is a therapy center for people with spinal cord injuries. Its clients rave about the highly specialized therapy sessions -- but struggle with the cost. Kathy Fuetsch drives to SCI-FIT each week from Reno for a session with her daughter Caitlin. Seven years ago, Caitlin suffered two severe strokes at the age of 25. “I was saying, I don’t know if we’re going to be coming back, because for 8 hours a month, it’s $750,” Kathy said. The Stock Radio Interview with Lalit Dhadphale, CEO of Healthwarehouse.com, Inc. Prescription drugs can cost you a pretty penny but there are a few ways to save on the drugs you need every month. The solution is simple. Shop around. Consumer advocate Michelle Mortensen did some secret shopping for you to show how different prices can be at local pharmacies. (FLORENCE, KY) -- HealthWarehouse.com, Inc. (HEWA), the only VIPPS-accredited online pharmacy licensed in all 50 states, today reiterated its commitment to provide safe online prescriptions and true drug-price transparency, amid increases in fraudulent online pharmacies. HealthWarehouse.com is currently the only pharmacy that meets Google’s stringent criteria to sell prescription items online and is the only pharmacy that lists drug prices on Google Shopping. According to the U.S. Food and Drug Administration, only three percent of online pharmacies are safe and legal. In other words, consumers need to be extremely cautious when purchasing their prescriptions online. In order to sell prescriptions on Google Shopping, a company must have an online pharmacy, list actual drug prices online allowing consumers to purchase and be VIPPS-accredited. HealthWarehouse.com Inc., a Northern Kentucky-based online and mail-order pharmacy firm, has hired Daniel Seliga as chief operating officer and chief financial officer. Seliga, 50, who had served as a financial and operational consultant to HealthWarehouse.com since August 2013, was credited with solidifying the financial reporting and pharmacy operations of the company (OTCQB: HEWA). “Dan has held several leadership positions in operations and finance in various companies for 20 years, and we expect his skills, experience and leadership to contribute significantly to HealthWarehouse.com’s future growth and development,” CEO Lalit Dhadphale said. (CINCINNATI, OH) -- HealthWarehouse.com, Inc. (HEWA), the only VIPPS accredited online pharmacy licensed in all 50 states, announced today that it has appointed Daniel Seliga as Chief Operating Officer and Chief Financial Officer. “I am pleased to announce this new executive appointment as it serves to significantly enhance and strengthen the management of HealthWarehouse.com’s expanding operations and positions the Company for future growth,” said Lalit Dhadphale, the Company’s President and Chief Executive Officer. Seliga, 50, has provided financial and operational consulting to HealthWarehouse.com since August 2013. His expertise in these areas has solidified financial reporting and pharmacy operations for the Company. (FLORENCE, KY) -- HealthWarehouse.com, Inc. (HEWA), was recently featured in U.S. News & World Report, thestockradio.com, and WestBrook Radio as a legitimate, low cost solution for consumers struggling to pay for rising prescription drugs costs. The recent U.S. News & World Report article features HealthWarehouse.com as a safe, reliable option for consumers looking to save money on rising prescription drug prices. It also warns consumers of scam online pharmacies, listing red flags such as lack of a VIPPS seal. VIPPS stands for Verified Internet Pharmacy Practice Sites and non-VIPPS accredited websites often do not require a valid prescription from a U.S. doctor, nor the ability to consult with a licensed pharmacist. Prescription drug prices are rising, as are tempers. On Dec. 9, a congressional hearing looked into the rising cost of medicine and what appears to be a troubling trend: pharmaceutical companies purchasing already-available drugs and selling them for much higher prices. Several companies reportedly have done this in recent years, although Turing Pharmaceuticals AG has become the most infamous example. The company received a ton of negative headlines earlier this year for buying the rights to an antiparasitic drug, Daraprim. The 65-year-old drug had been selling for $13.50 a pill; Turing raised the per-pill price to $750. But even if your monthly medication payments aren't as high as your mortgage, what you pay may still be doing a number on your bank account. In April, IMS Institute for Healthcare Informatics, a global information and technology services company, released a report showing that consumers spent $373.9 billion on medication in 2014, a new record high. As open enrollment for Medicare Advantage kicks in to full gear, more seniors than ever will need to research, evaluate and decide on which plan and options are best for them. With drug prices continuing to rise, this could be a costly decision if not considered in a timely manner. Seniors today need to be smart consumers to avoid sticker shock at the pharmacy counter. Like anything else you shop for in life, whether it’s clipping coupons or comparing prices at multiple stores for the best deal, shopping for prescriptions is no different. An activity that was previously reserved for the uninsured, shopping prescription drugs prices has now become a necessity for the insured, especially those enrolled in Medicare Advantage plans. Five of the top prescription drug plans will see double-digit premium increases next year. According to Avalere Health, an advisory company focused on healthcare business strategy and public policy, the average prescription premium for Medicare Advantage enrollees will be over $40 per month, starting in 2016, a first in the program’s history. More than 15 million people enrolled in the top 10 Medicare Part D prescription drug plans will experience average premium increases of 8 percent in 2016. The top 10 plans account for more than 80 percent of enrollment in Medicare Advantage plans. Read full article at ConsumerReports.org. (CINCINNATI, OH) -- HealthWarehouse.com, Inc. (HEWA), the only VIPPS accredited online and mail-order pharmacy licensed in all 50 states, announced financial results for the quarter ended September 30, 2015. Net sales for the three months ended September 30, 2015 increased to $1,689,457 from $1,474,986, an increase of $214,471, or 14.5%, resulting from growth in core prescription and over-the-counter sales offset by a reduction in business-to-business sales. Core over-the-counter revenue grew 40.3% and orders grew by 44.3% due to advertising efforts and improved order fulfillment rates and customer satisfaction. Core prescription orders grew 17.3% as new customers grew 70.3% and repeat customers grew 22.1%, continuing the reversal of the downward trend experienced during 2014 due to lack of advertising efforts in the first three quarters of 2014. Net sales for the nine months ended September 30, 2015 increased to $5,172,974 from $4,654,404, an increase of $518,570, or 11.1%, resulting from growth in core prescription, over-the-counter and business-to-business sales. (FLORENCE, KY, November 4, 2015) -- As open enrollment for Medicare Advantage kicks in to full gear this month, seniors will need to research, evaluate options and decide which plan is best for them. With drug prices continually on the rise, this could be a timely and costly decision. HealthWarehouse.com is often times between 60-70 percent less in price than the average retail pharmacy cash price charged to consumers. By using an intuitive online pharmacy such as HealthWarehouse.com, seniors can order prescriptions online, have them delivered to their homes and save money without insurance. HealthWarehouse.com's drug formulary includes the most commonly prescribed medications at prices below the typical copay or prescription premium. The necessity to shop for the best prescription drug prices is a growing reality for those with health insurance, especially those enrolled in Medicare Advantage plans. In advance of the premium hikes taking effect in 2016, we have increased our drug catalog to over 3,000 medications with affordable prices to provide an easy and cost-effective option. (FLORENCE, KY, October 6, 2015) -- HealthWarehouse.com, Inc. (HEWA), the only VIPPS accredited online pharmacy licensed in all 50 states, announced today that it was awarded the 2015 Bizrate® Circle of Excellence Award for the fourth time and is the only VIPPS accredited pharmacy selected to win the award. "Looking across the last 16 years of the Bizrate Circle of Excellence Award, we are finding that online retailers are trending toward higher and higher levels of customer satisfaction each year," says Bill Glass, CEO of Connexity, Inc., parent company to both Bizrate and Bizrate Insights. "We are proud to honor these retailers that go above and beyond the customer experience. Bizrate Circle of Excellence Award winners understand that dedication to good customer service every day and with every transaction, translates to more customers, more loyal customers, and ultimately, increased sales." (CINCINNATI, OH, August 12, 2015) -- HealthWarehouse.com, Inc. (HEWA), the only VIPPS accredited online and mail-order pharmacy licensed in all 50 states, today announced financial results for the quarter ended June 30, 2015. For the quarter ended June 30, 2015, net sales improved to $1,870,840 up 27.9% from the quarter ended June 30, 2014. Gross margin increased to 67% from 60% while net loss narrowed by 78.2% to ($79,681) for the quarter ended June 30, 2015 from ($365,042) for the quarter ended June 30, 2014. For the quarter ended June 30, 2015, HEWA reported adjusted EBITDAS of $109,610, vs. adjusted EBITDAS of ($96,063) for the quarter ended June 30, 2014, an improvement of 214.1%. The Company believes that adjusted EBITDAS (Earnings Before Interest, Taxes, Depreciation, Amortization and Stock-Based Compensation), a non-GAAP financial measure, is useful in evaluating its operating performance compared to that of other companies in our industry. (CINCINNATI, OH, June 11, 2015) -- HealthWarehouse.com, Inc. (HEWA), the only VIPPS accredited online and mail-order pharmacy licensed in all 50 states, today announced a partnership with RxREVU, Inc. to bring prescription drug delivery options and drug price transparency to U.S. consumers. RxREVU, Inc. offers the world's most advanced Prescription Intelligence Platform on the market today. RxREVU's platform brings all clinical protocols, formulary, costs, claims, restrictions and more, with their clinical, adherence and efficacy data into one intuitive platform. With RxREVU, it's easy to get the right information to the right person at the right time - to help members and providers make more-informed decisions. RxREVU's customers now have access to HealthWarehouse.com's drug pricing, including the option to purchase the medications for home delivery. (CINCINNATI, OH, May 26, 2015) -- HealthWarehouse.com, Inc. (HEWA), the only VIPPS accredited online and mail-order pharmacy licensed in all 50 states, announced today that it will present at the 2015 Marcum MicroCap Conference on Wednesday, May 27, 2015 in New York City at the Grand Hyatt Hotel. The Company's presentation by Lalit Dhadphale, President & CEO, is scheduled to begin at 4:00 p.m. ET. The annual Marcum MicroCap Conference is a showcase for public companies with less than $500 million in market capitalization. For more information or to register, please visit the conference website. (CINCINNATI, OH, April 2, 2015) -- HealthWarehouse.com, Inc. (HEWA), the only VIPPS accredited online and mail-order pharmacy licensed in all 50 states, today announced financial results for the year ended December 31, 2014. For the year ended December 31, 2014, gross margin improved to 59.3%, up from 50.0%, while net loss narrowed by 67.5%, to ($1,783,279) from ($5,489,892). Net sales were $6,129,660 for the year ended December 31, 2014, a 40.1% decrease from the comparable period in 2013, as the Company shed non-profitable business relations in 2014 to focus on the higher margin out of pocket cash prescription market. For the year ended December 31, 2014, HEWA reported adjusted EBITDAS of ($596,594), vs. adjusted EBITDAS of ($870,207) in the year ended December 31, 2013, an improvement of 31.4%. The Company believes that Adjusted EBITDAS (Earnings Before Interest, Taxes, Depreciation, Amortization and Stock-Based Compensation), a non-GAAP financial measure, is useful in evaluating its operating performance compared to that of other companies in our industry. Mr. Lalit Dhadphale, HealthWarehouse.com's President and CEO, commented, "In order to position our Company for sustainable and profitable growth, we made the decision to focus our business efforts on the growing out of pocket prescription market and wind down other non-profitable business relations in late 2013 and 2014. With continued pressures on employers to contain healthcare costs, consumers are assuming higher co-pays and deductibles, and paying more upfront out of pocket expenses for their prescriptions. This opportunity in the cash prescription market has never been greater." (CINCINNATI, OH, March 18, 2015) -- HealthWarehouse.com, Inc. (HEWA), the only Verified Internet Pharmacy Practice Site (VIPPS) accredited online pharmacy licensed in all 50 states serving consumers who pay out of pocket for their prescriptions, today announced a renewal of the company’s Senior Secured Debt for up to 12 months. "When we first became involved with HealthWarehouse.com, we saw the long term potential of the company. Despite many challenges over the past 24 months, the company has been able to trim costs, stabilize revenues and increase gross margins significantly. While challenges remain with the balance sheet, we believe management is moving the company in the right direction by focusing on profitability and its core business, the out-of-pocket cash prescription payer market," said Tim Reilly, Managing Member of Melrose Capital. Terms of the renewal from Melrose Capital extend the debt six months to September 1, 2015 and conditional on a $350,000 capital raise the maturity date can be extended an additional six months to March 1, 2016. "We are fortunate to have great partners like Melrose Capital involved in the company. The opportunity to service consumers who pay out of pocket for their prescriptions continues to grow. As the leader in this growing niche, we continue to stay focused on helping consumers save money by providing them with legitimacy, value and convenience," said Lalit Dhadphale, President & CEO of HealthWarehouse.com. Who has the lowest generic drug prices? (CINCINNATI, OH, January 27, 2015) -- HealthWarehouse.com, Inc. (HEWA), the only VIPPS accredited online and mail-order pharmacy licensed in all 50 states, today made public letters sent to Senator John McCain (R-Az. ), Senator Amy Klobuchar (D-Minn.), Senator Paul Rand (R-Ky.), Senator Mitch McConnell (R-Ky.) and Congressman John Boehner (R-Oh.). The letters address the re-introduction of legislation that would allow Americans to purchase prescription drugs from Canada. The bill known as the “Safe and Affordable Drugs from Canada Act” has been advocated by Senators John McCain and Amy Klobuchar. HealthWarehouse.com Inc (HEWA), the sole company rightfully operating as the Verified Internet Pharmacy Practice Site (VIPPS), has now redesigned its website to serve customers who pay out-of-pocket for their prescriptions. The new site will now enable customers to order their drugs even through tablets and mobile devices. HealthWarehouse.com Inc (HEWA) has seen very low trading activity over the last 52 weeks. HEWA has been trading around $0.15-$0.20 from May to November 2014, saw a slump in December but seems to be getting back up in January and is currently trading at $0.3. Lowest the company saw in the last 52 weeks was $0.05 and the highest at $0.56. HealthWarehouse.com Inc has been keeping itself in news and on January 7, 2015 announced the relaunch of its website to serve consumers who pay out of pocket for their prescriptions, a market expected to grow to $80 billion in 2015.